You will soon be surrounded by beautiful CSS aboard a Geeks4Sail week! As a web geek, how much time do you spend in CSS on a daily basis? One hour? Three hours? Maybe even 6 hours? If you didn't say "24 hours a day, every day", then it's time to immerse yourself in CSS! You know, C for Caribbean, S for Sand and Sun! 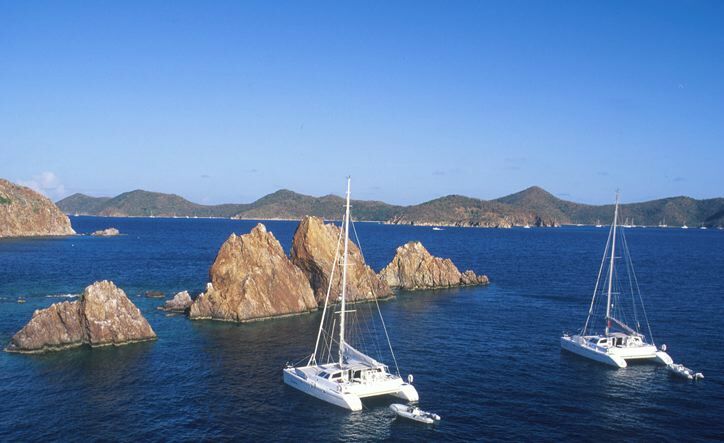 Or how about C for Catamaran, S for Sailing and Snorkeling?! Whatever your definition, relax, you're in the islands, mon! 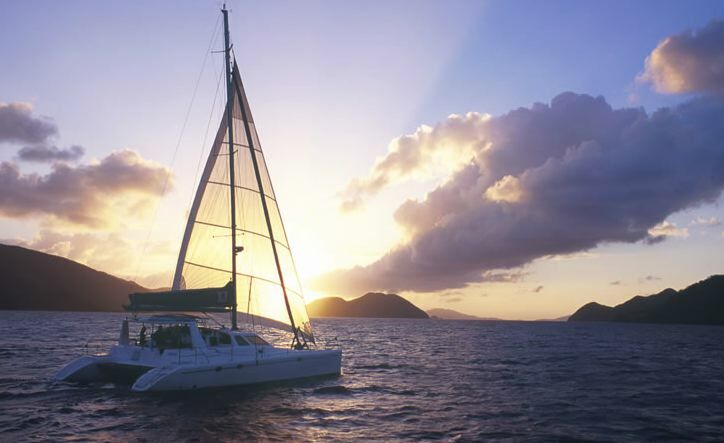 Introducing Geeks4Sail™ — a free flowing, floating geek retreat on a 50 foot luxury catamaran. Hang out, ask questions, exchange tips, and talk about any "geek" subject you want while surrounded by stunningly beautiful CSS! Geeks4Sail™ is a one-of-a-kind opportunity to network and socialize with an intimate (maximum of 8-10 people) group of fellow professionals from the web industry. The last trip was an absolute blast — but don't take our word for it, have a look for yourself! Spanning 8 days and 7 nights , it's coconuts, sand, sea and geek talk at this unique barcamp — with the emphasis on "bar"... what could be better?! And for those non-geek partners, don't worry — there's plenty of room and rum for them to escape from the geekery! No sailing experience is required, as your Captains, Stef and Greg, have that part covered. If you have sailed before and you want to lend a hand though, they will definitely put you to work. But nobody will stare at you if you'd rather just lay on the trampoline and soak up the Caribbean sun. If this all sounds like fun, click on over and reserve your cabin today! Cabins cost $3500 for the week and can accommodate up to two people on a single queen size bed. Choose from either February 9-16, 2013 or February 17-24, 2013. And hurry, space is very limited! Shorts and T-shirts will definitely be your primary wardrobe de rigeuer, but a pair of jeans (or any type of long pants) should be included for cool evenings – not to mention your flight to/from the islands. Ladies - if you prefer sundresses or the like, feel free to bring those for shore excursions, dinner, or just because you don't like pants! A light, long sleeve shirt (for sun protection), as well as a lightweight sweatshirt, sweater or windbreaker because evenings can be chilly – even in the tropics. Bathing suits – duh – but you will probably want to bring several with you because, not only will you be swimming every day, wet stuff can take a while to dry in humid climbs. Beach towel or camping towel (optional) - a towel for showering will be provided, but you will probably want one that "gets salty". Lightweight rain jacket – the last thing you want on vacation is rain, but it is sadly a regular occurance in the caribbean... why do think it's so green? Personal hygiene items (shampoo, soap etc.) - showers can be taken onboard, but we generally take showers in one of the marinas where we will dock (usually every other night), so make sure to bring a pair of flip-flops that you don't mind getting wet. Space to store items such as large suitcases is very limited, so please try to pack in a 22" rollaboard or, even better, a collapsable duffle bag. Sun protection – and we're not just talking about sunscreen. You'll probably also want to bring a wide brimmed hat (with a strap), a t-shirt to swim/snorkel in and definitely don't forget your sunglasses! Boat friendly shoes with light colored or non-marking soles – and you can definitely leave the stilettos at home. Passport – even if you decide to fly into St. Thomas, the BVI's are part of the UK and therefore a foreign country. Snorkeling gear (optional) – if you own your own, bring it. While the boat has gear available, we don't know the condition of it. Camera – like you would ever dream of going on vacation without one! If you've got a point-n-shoot that is waterproof, there are tons of fish, rays, turtles and coral at every stop. 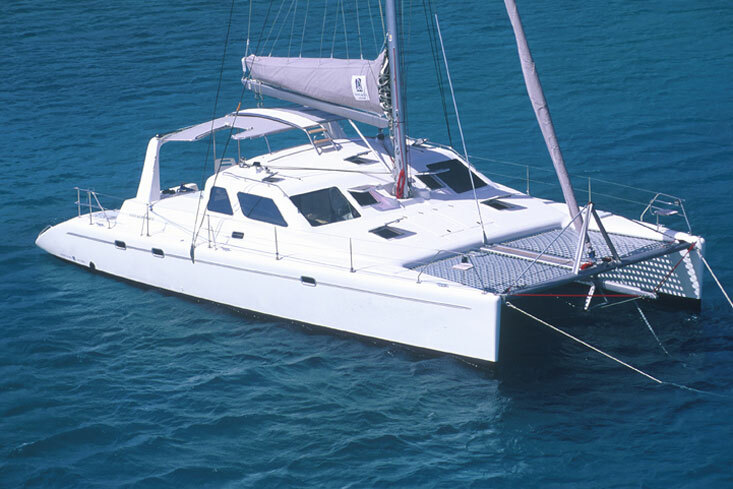 You will be sailing aboard a 50' luxury catamaran. 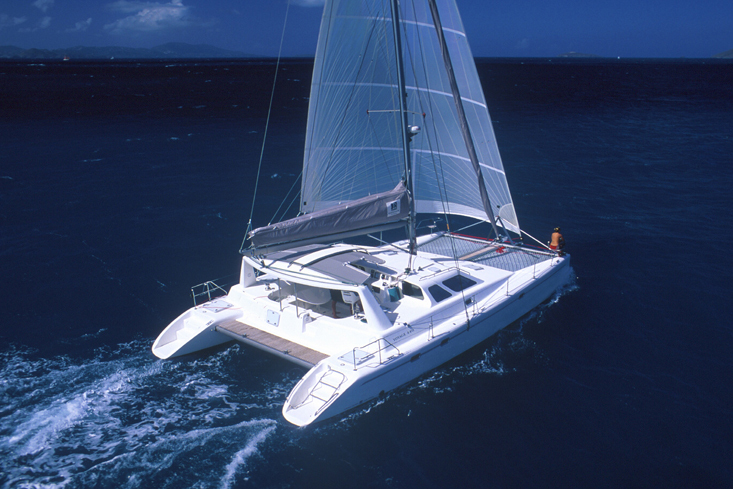 Unlike monohull sailboats, catamarans are known for their distinctive wide beams. This wide beam means not only are they very roomy, they are even more stable and less prone to pitching in heavy winds and seas. 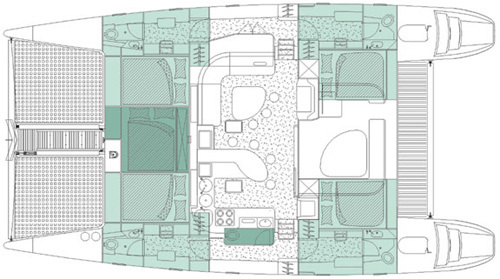 The boat can accommodate up to 8 guests in its 4 cabins. Each cabin contains a queen size bed with bed linens, pillows and bath towels, along with a head and wet shower. For those wondering about a "wet" shower, this simply means that there is no shower cabin, rather the entire bathroom gets "wet" when showering. 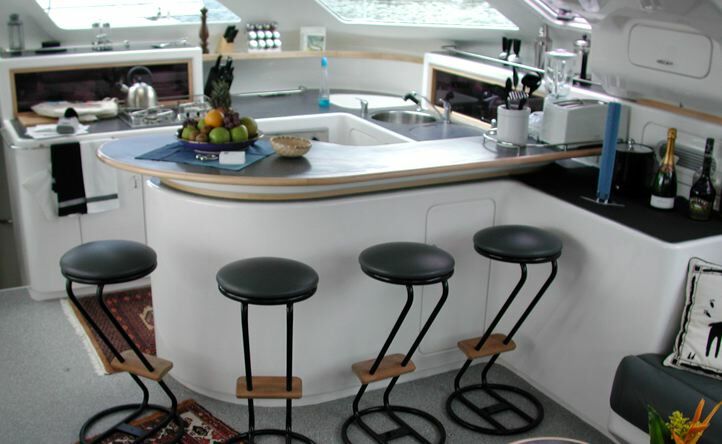 The boat contains a fully equipped galley for meal preparation and essentials like coffee and cold beer, wine and of course, rum – it is the Caribbean after all! The boat will be provisioned prior to your arrival with basic breakfast and lunch items, coffee, juices, and water. Any special dietary concerns or requirements should be noted on the registration form. During the week, we will have an (almost) daily opportunity to stock up on anything that may have been forgotten or is running low – like rum! Every evening, we will head into shore for dinner (not included), drinks (definitely not included) and hanging out in some really cool places – you can read more in the Itinerary section. Please calculate approximately $50/night per person for dinner – depending on your appetite of course, along with your nightly rum budget. There is limited internet access in the islands, although a wifi hotspot can generally be found in most of the places where we will dock — just don't expect the blazing speeds you're used to from home. And, obviously, while we are out to sea, "you shood poot dat cumpoota away, mon"! If you're an ATT or T-Mobile customer, there is spotty coverage, and it's not unheard of to even grab a sliver of 3G. The British telekom, Lime, covers the BVI's and is available for those who aren't worried about the roaming fees. As for other (Verizon, Sprint) carriers, check with them, as we don't have any information to provide. Soper's Hole to Norman Island - After lunch either aboard or at one of the restaurants in Soper's Hole, we will head out for our first day under sail. We'll have a quick 2 hour sail as you get settled in onboard. 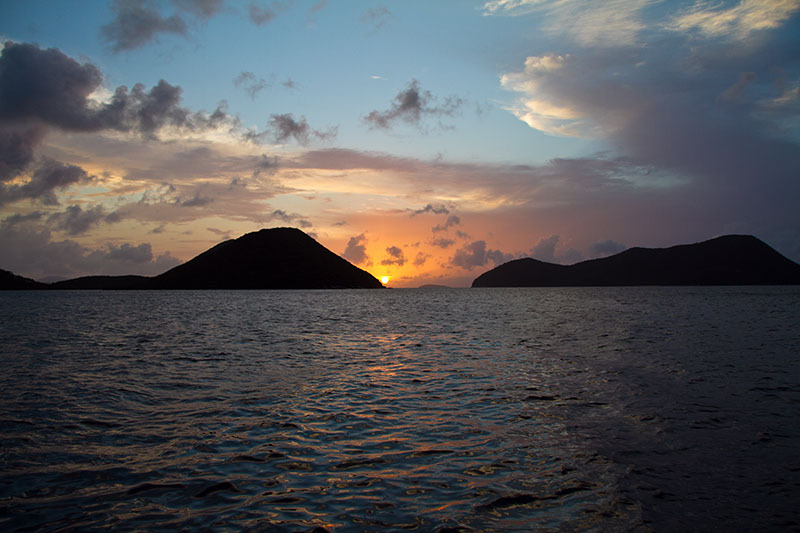 If luck is on our side, we'll find an open mooring at the Indians – one of the premier snorkeling spots in the BVI – before before snagging a mooring ball in the Bight on Norman Island. Here, you'll also have the opportunity to snorkel the Caves or just hang out in the sun. Dinner will be either at the Pirates Bight Bar and Restaurant, or aboard Willy T's floating bar. 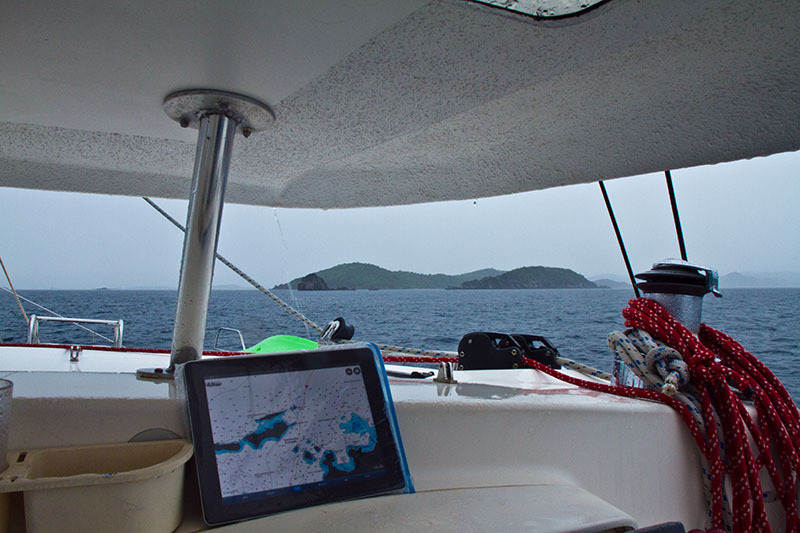 Peter Island and Salt Island - Today's sail is a short one. 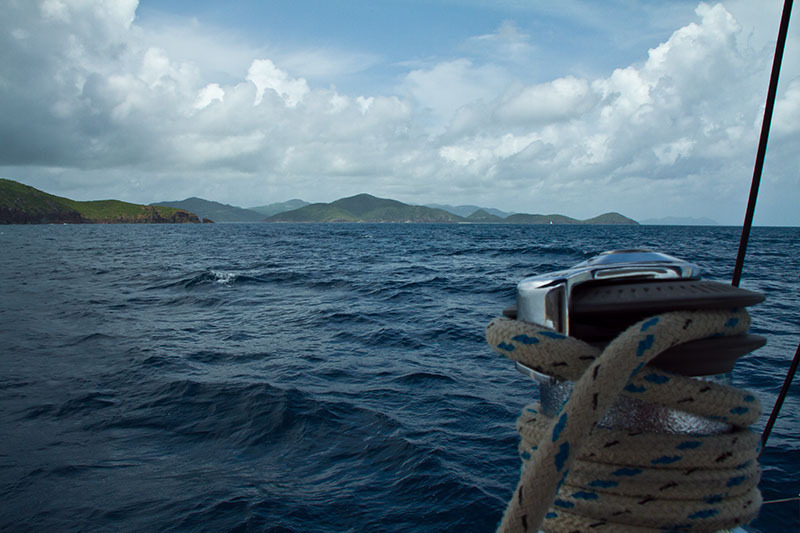 We will pass Peter Island enroute to Salt Island where we will grab a mooring close to the wreck of the Rhone. Most of the wreck is too deep to reach without scuba gear, however the bow is resting in 25 feet of water and can be easily seen while snorkeling. After our morning swim, we will backtrack to Peter Island and the beautiful Deadman Bay, internationally acclaimed as one of the most beautiful beaches in the Caribbean. 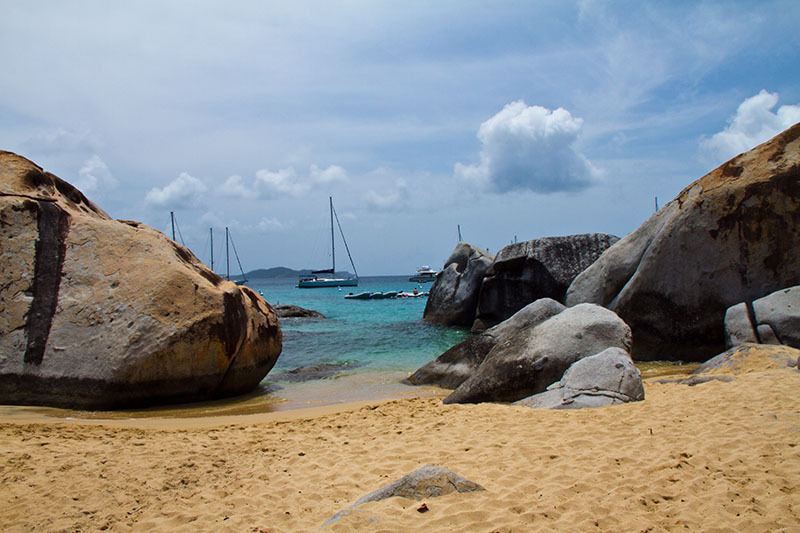 The Baths at Virgin Gorda - Sure to be a highlight of your week, our voyage today takes us to Virgin Gorda. After docking in the marina, we'll hop a taxi to the Baths where you will experience the magical ambience of the legendary granite boulders (which are the backdrop for this site)! You'll have a blast snorkeling in and out of the boulders, full of marine life. 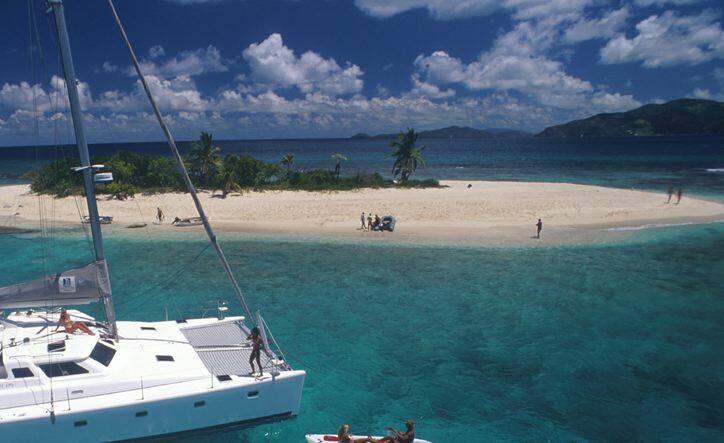 Marina Cay - Plenty of snorkeling fun is on tap today, with the first stop at the Dogs. We will hook a ball on George Dog and head into the water for a great snorkel along the rock walls. After lunch, it's a short sail to Marina Cay, a small, unassuming island with a nightlife worthy of an island twice its size! Cane Garden Bay - A favorite stop on any tour of Tortola is the picturesque Cane Garden Bay. With a reef protecting the bay, it's perfect for snorkeling or just floating in the amazing water. Evenings ashore in Cane Garden Bay are full of music and fun. And for a special treat take a walk to the oldest rum distillery in the Caribbean – 400 years and counting! 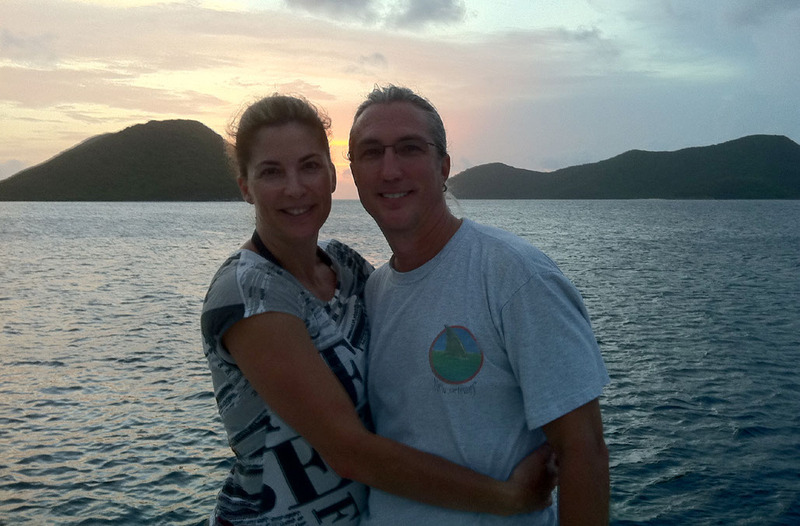 Jost Van Dyke - If you've ever dreamed of standing on your own deserted island, today's your day! 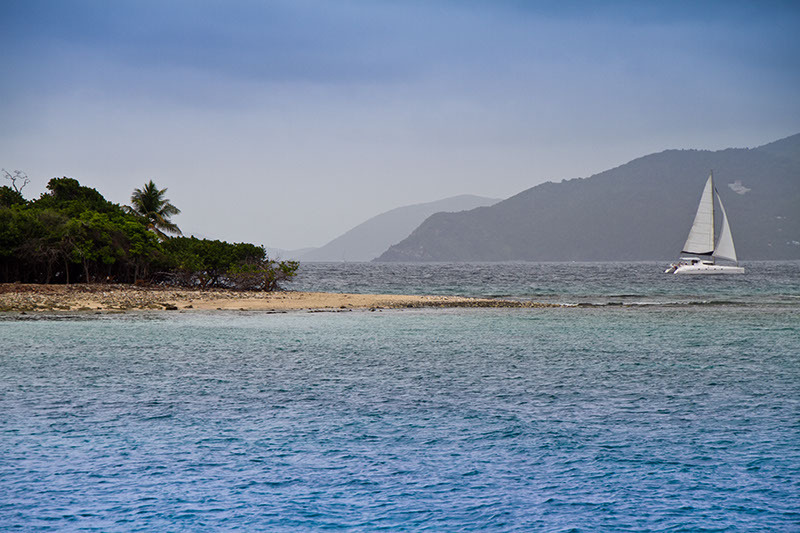 On our way to the island of Jost van Dyke, we'll anchor at Sandy Spit - a tiny piece of sand sticking out of the crystal blue waters. 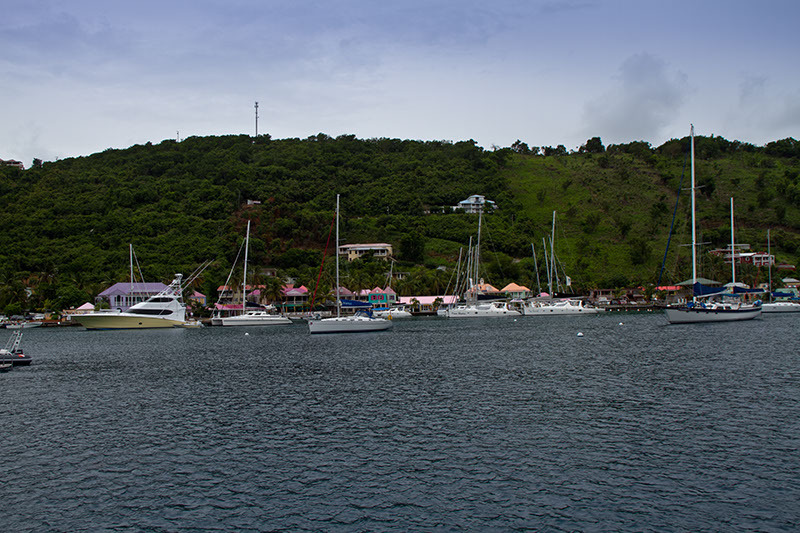 Then on to Jost where we will grab a ball and swim ashore (hence the name) for lunch at the Soggy Dollar Bar. Dinner will be either at Foxy's or Sidney's. Sadly, it's time to head back into Soper's Hole and send you home, mon! The total cost of the week is $3500, based upon double occupancy — in other words, each berth is a queen bed, and that's what you are paying for. If you want to share the cost of the berth with a roommate, please select the Double Occupancy paying seperately ($1750) option and in the Roommate field, indicate the name of your roommate. Upon completing the reservation form, you will receive an invoice from Geeks4Sail, LLC for your initial down payment in the amount of $1000 (or $500 for those sharing a berth with a roommate). This initial down payment is due upon receipt and can be paid through PayPal. A second payment of $1250 ($650) will be invoiced on November 15th, 2012. A third and final payment of $1250 ($650) will be invoiced on January 5th, 2013. In the event that you would prefer an alternate payment plan (for example, full payment up-front), or method of payment, please indicate this in the Comments field of the reservation form. For bookings occuring after the dates above, you will receive an invoice for the cumulative amount due at the time of booking. In the event of an unexpected need to cancel your reservation, a penalty of $500 ($250) will be withheld from your initial down payment, unless you cancel within 48 hours of that payment. Upon receipt of the second invoice, all payments are non-refundable unless the cabin can be filled from the waitlist or through your own referral. We know, we know. A liability waiver is probably the most obnoxious and boring of all documents, but it is a legal necessity and must be completed before moving on to the reservation form. THIS IS A LEGAL DOCUMENT. PLEASE READ THIS DOCUMENT CAREFULLY BEFORE SIGNING. Prior to participating in the Ultimate CSS BarCamp, sponsored by W3Conversions, LLC, please read the following agreement carefully and indicate your understanding by signing below. I understand and accept that these risks expose me to, but are not limited to, the following consequences: death, serious injuries which may result in complete or partial paralysis, brain damage, drowning, and serious injury to other aspects of my general health and well being. I also understand that the risks in participating in the experiential activity include not only the foregoing physical injuries, but also impairment of my future abilities to earn a living, to engage in business, social and recreational activities, and generally to enjoy life. I am voluntarily participating in the Ultimate CSS BarCamp with full knowledge of the risks, hazards and dangers involved. These risks and dangers may be caused by my own action or inaction, the action or inaction of others participating in the Ultimate CSS BarCamp, the condition in which the Ultimate CSS BarCamp takes place, or any negligence of the "releasees" named below. Understanding the risks mentioned above, I hereby state that I and/or my family, who are fully capable of participating in the Ultimate CSS BarCamp are physically fit to participate in any activity I participate in. IN CONSIDERATION OF MY REQUEST TO PARTICIPATE IN THE ULTIMATE CSS BARCAMP, AND AS A CONDITION OF THE RIGHT TO PARTICIPATE IN THE ULTIMATE CSS BARCAMP, I PERSONALLY ASSUME ALL RISKS INCIDENT TOTHE ULTIMATE CSS BARCAMP. I ALSO WAIVE, RELEASE AND FOREVER DISCHARGE W3CONVERSIONS, LLC AND ANY OF ITS EMPLOYEES, CONTRACTED AGENTS, OR ASSISTANTS FROM ALL LIABILITIES, LOSSES, DAMAGES OR COSTS OF ANY NATURE THAT MAY ARISE IN CONNECTION WITH MY TRAVEL TO OR PARTICIPATION IN SUCH ACTIVITIES (INCLUDING RESCUE ACTIVITIES) ASSOCIATED WITH THE ULTIMATE CSS BARCAMP. I HEREBY AGREE NOT TO FILE SUIT AGAINST W3CONVERSIONS, LLC OR ANY OF ITS EMPLOYEES. I AGREE TO INDEMNIFY AND HOLD W3CONVERSIONS, LLC AND EMPLOYEES HARMLESS FROM ALL LIABILITIES, LOSSES, DAMAGES OR COSTS OF ANY NATURE THAT MAY ARISE IN CONNECTION WITH MY TRAVEL TO OR PARTICIPATION IN THE ULTIMATE CSS BARCAMP, INCLUDING RESCUE ACTIVITIES. THE TERMS OF THIS DOCUMENT SHALL BIND ME, MY HEIRS AND PERSONAL REPRESENTATIVES. Prior to signing this document, I have had an adequate opportunity to read and understand it, have had an opportunity to ask questions about it, and any questions I have had have been answered to my satisfaction. Enough already! Take me to the Registration Form! * If you would like to be billed separately from your roommate, you must provide the name and email of your roommate below. I have read and understand the payment schedule, cancellation policy and liability agreement.